I am so thankful that my dad spent his own money to buy Lego Dimensions Goonies Level Pack. He purchased it when it was half off, so he only had to pay fifteen dollars for it. That price is actually almost reasonable for Lego Dimensions Goonies Level Pack. It comes with Sloth, One-Eyed Willy’s Pirate Ship, and the Skeleton Organ. The pirate ship transforms into Fanged Fortune, and The Interno Cannon. The organ transforms into Skeleton Jukebox, and Skele-Turkey. The battle arena for Lego Dimensions Goonies Level Pack is Shipwreck Grotto. I do not like this battle arena. It is lame with too many traps. The skills Sloth have are Cracked Lego Objects, Super Strength Handles, Grapple, Dig, Dive, and Target. He has a good range of skills that are helpful in the Goonies level. It took just under an hour to go through the Goonies level. There is also a Goonies world area that comes with Lego Dimensions Goonies Level Pack. It has a decent size to it. The comments from Sloth are pretty lame. We ran into multiple glitches while playing Lego Dimensions Goonies Level Pack. In fact we got another save corrupted while playing Lego Dimensions Goonies Level Pack. Thankfully we have a backup on a flash drive. Hundreds of hours would have been lost if we had not done that. Lego Dimensions Goonies Level Pack touches on the Goonies movie, and shows us some of the areas. Lego Dimensions Goonies Level Pack starts mainly where we run into Sloth in the movie. Lego Dimensions Goonies Level Pack felt really short to me. The two vehicles are about worthless in my opinion. We have to use the organ to get through certain areas. It was funny to have Sloth and Superman together in the same place. The Skeleton Organ is surprisingly stable. The pirate ship has all kinds of parts that can easily fall off. So be careful with it. Sloth’s extra head/hair piece is interesting and fits the character from the movie. 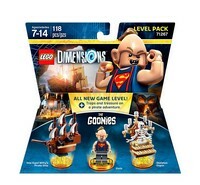 If you are a super Lego Dimensions fan or a Goonies fan then you might like Lego Dimensions Goonies Level Pack. Just do not expect too much from it.